The copan:CORE World-Earth modeling framework will support the development and use of dynamical models of those processes that are important for the mid- to long-term fate of nature and humanity on a global scale, to gain a better understanding of their feedbacks, important parameters, and possible emergent dynamics, and to help answering research questions about possibilities of sustainable management and policy. Processes we are currently studying include those on the right. 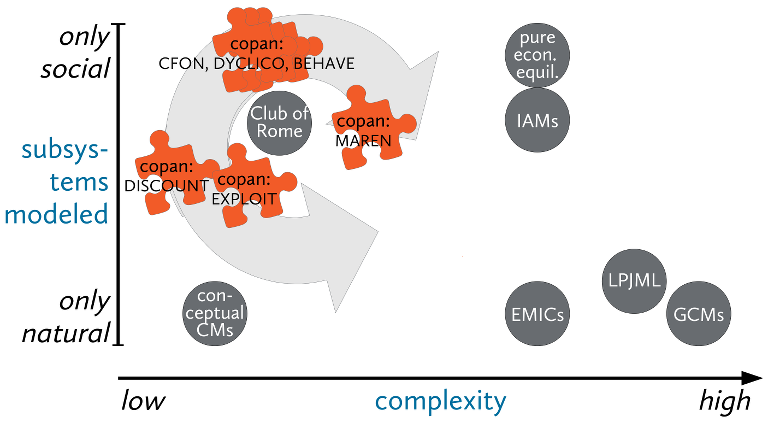 Circles are copan models including natural processes, boxes are copan models including only socio-economic processes yet. A conceptual model for investigating the coevolution of local renewable resources and the individual efforts of exploitation of agents in the society. The effort represents a simple form of a value system that can either be sustainable or non-sustainable. The society is represented by a social network where agents may adapt their acquaintance structure according to their own value-system (Connections with agents of the same values are preferred over connections with agents of different values) as well as imitate their neighbors efforts probabilistically according to the difference in individual harvest. Depending on the waiting time after which agents compare their performance with those of others the system converges either to a sustainable (all agents choose for a sustainable value system and effort) or non-sustainable state. Generally speaking, a slower uptake dynamic causes a higher probability to reach a sustainable final state since agents reflect more the effect of their own and others behavior. A conceptional model of the co-evolution of global carbon stock and discount factors of countries. Countries constantly optimize their emissions non-cooperatively as in a standard emissions game (e.g. Barrett 1994). They assign either a low or a high weight to the climate change related damages caused by their emissions in later years. This discount factor is a social trait transmitted via imitation with a probability of adoption depending on exposition and performance. The combined nature-society system typically converges to either a low stock, low discounting fixed point or to a high stock, high discounting fixed point, but can show more complex behaviour depending on parameter settings. Typically, a faster imitation dynamics helps reaching the low-stock equilibrium. This conceptual model studies the formation of coalitions (groups of cooperating agents, as for example a cartel) on a network in a dynamic context. Agents are chosen at random and can propose cooperation between partners they are connected to, stay in their state or choose to leave an existing coalition that breaks into its connected pieces. All moves are based on rationality. In addition we allow for a changing network structure in varying the number of agents and their local connections by possibly rewiring from non-coalition to coalition members. This way we implemented the concept of coevolution: an influence of the coalition structure on the network and vice versa. With this approach we want to explain aperiodic oscillatory behavior in the formation and breakdown of real-world cartels and show the emergence of phase transitions on adaptive coalition networks. A game-theoretic model of the dynamics of international climate coalition formation between the six major emitters. Coalitions of countries constantly optimize their emissions cooperating within but not between coalitions. Countries have heterogeneous abatement costs, climate damage functions, and bargaining power, and can dynamically leave coalitions or propose coalition mergers. They form beliefs about this stochastic Markov process that converge to an equilibrium in beliefs. In equilibrium, a global coalition will provably form with certainty, but only bottom-up in several steps and with uncertainty about the exact path and final burden sharing. Official PIK news item: Coalition-building for pricing CO2 could make sense even for egoistic countries, Further reading: Blog post for COP21 conference in Paris (2015). BEHAVE is a model of the coevolution of individual decision making or opinion formation and adaptive social network dynamics under external political pressure. The model incorporates realistic assumptions on human cognitive parameters such as the maximum number of social relationships that can be effectively maintained (Dunbar number). We would like to understand how transitions in the frequency of certain opinions or behaviors are accompagnied by and related to changes in non-trivial social network properties such as node centrality and conditional dependencies between neighboring nodes that are related to processes like ostracism and social marginalization. It can be shown that empirically observed time series data can be reproduced only if the full coevolutionary dynamics is taken into account. In the future, we would like to use BEHAVE to study the transition to sustainable lifestyles in social networks. *The first three authors share the lead authorship. A very low-dimensional deterministic conceptual model of four global carbon stocks, temperature, human population, economic growth, and technological progress for the classification and stability analysis of main types of coevolutionary behaviour (saturation, persistent oscillation, unbounded growth, etc.) and transitions between them. No spatial resolution, simple functional forms allowing analytical treatment, inspired by existing model components from climate science, economics, and demographics.